I am currently learning about Big O Notation running times and amortized times. I understand the notion of O(n) linear time, meaning that the size of the input affects the growth of the algorithm proportionally...and the same goes for, for example, quadratic time O(n2) etc..even algorithms, such as permutation generators, with O(n!) times, that grow by factorials. Similarly, if there was a nested loop, the time would be O(n2). But what exactly is O(log n)? For example, what does it mean to say that the height of a complete binary tree is O(log n)? I do know (maybe not in great detail) what Logarithm is, in the sense that: log10 100 = 2, but I cannot understand how to identify a function with a logarithmic time. I cannot understand how to identify a function with a log time. only one will need to be chosen. This is why, for example, looking up people in a phone book is O(log n). You don't need to check every person in the phone book to find the right one; instead, you can simply divide-and-conquer by looking based on where their name is alphabetically, and in every section you only need to explore a subset of each section before you eventually find someone's phone number. Of course, a bigger phone book will still take you a longer time, but it won't grow as quickly as the proportional increase in the additional size. We can expand the phone book example to compare other kinds of operations and their running time. We will assume our phone book has businesses (the "Yellow Pages") which have unique names and people (the "White Pages") which may not have unique names. A phone number is assigned to at most one person or business. We will also assume that it takes constant time to flip to a specific page. O(1) (best case): Given the page that a business's name is on and the business name, find the phone number. O(1) (average case): Given the page that a person's name is on and their name, find the phone number. O(n): Find all people whose phone numbers contain the digit "5". O(n): Given a phone number, find the person or business with that number. O(n log n): There was a mix-up at the printer's office, and our phone book had all its pages inserted in a random order. Fix the ordering so that it's correct by looking at the first name on each page and then putting that page in the appropriate spot in a new, empty phone book. For the below examples, we're now at the printer's office. Phone books are waiting to be mailed to each resident or business, and there's a sticker on each phone book identifying where it should be mailed to. Every person or business gets one phone book. O(n log n): We want to personalize the phone book, so we're going to find each person or business's name in their designated copy, then circle their name in the book and write a short thank-you note for their patronage. O(n2): A mistake occurred at the office, and every entry in each of the phone books has an extra "0" at the end of the phone number. Take some white-out and remove each zero. O(nn): You fix the robot so that it's loading things correctly. The next day, one of your co-workers plays a prank on you and wires the loading dock robot to the automated printing systems. Every time the robot goes to load an original book, the factory printer makes a duplicate run of all the phonebooks! Fortunately, the robot's bug-detection systems are sophisticated enough that the robot doesn't try printing even more copies when it encounters a duplicate book for loading, but it still has to load every original and duplicate book that's been printed. Many good answers have already been posted to this question, but I believe we really are missing an important one - namely, the illustrated answer. What does it mean to say that the height of a complete binary tree is O(log n)? Binary search is an example with complexity O(log n). Let's say that the nodes in the bottom level of the tree in figure 1 represents items in some sorted collection. Binary search is a divide-and-conquer algorithm, and the drawing shows how we will need (at most) 4 comparisons to find the record we are searching for in this 16 item dataset. Assume we had instead a dataset with 32 elements. Continue the drawing above to find that we will now need 5 comparisons to find what we are searching for, as the tree has only grown one level deeper when we multiplied the amount of data. As a result, the complexity of the algorithm can be described as a logarithmic order. O(log N) basically means time goes up linearly while the n goes up exponentially. So if it takes 1 second to compute 10 elements, it will take 2 seconds to compute 100 elements, 3 seconds to compute 1000 elements, and so on. The explanation below is using the case of a fully balanced binary tree to help you understand how we get logarithmic time complexity. And that's how you get O(log n) which is the amount of work that needs to be done on the above tree to reach a solution. A common algorithm with O(log n) time complexity is Binary Search whose recursive relation is T(n/2) + O(1) i.e. at every subsequent level of the tree you divide problem into half and do constant amount of additional work. Others have given good diagram examples, such as the tree diagrams. I did not see any simple code examples. So in addition to my explanation, I'll provide some algorithms with simple print statements to illustrate the complexity of different algorithm categories. First, you'll want to have a general idea of Logarithm, which you can get from https://en.wikipedia.org/wiki/Logarithm . Natural science use e and the natural log. Engineering disciples will use log_10 (log base 10) and computer scientists will use log_2 (log base 2) a lot, since computers are binary based. Sometimes you'll see abbreviations of natural log as ln(), engineers normally leave the _10 off and just use log() and log_2 is abbreviated as lg(). All of the types of logarithms grow in a similar fashion, that is why they share the same category of log(n). When you look at the code examples below, I recommend looking at O(1), then O(n), then O(n^2). After you are good with those, then look at the others. I've included clean examples as well as variations to demonstrate how subtle changes can still result in the same categorization. 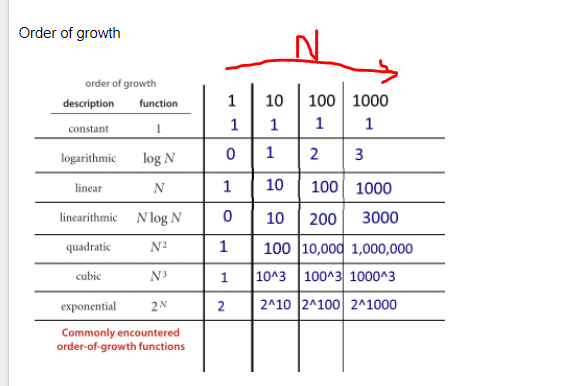 You can think of O(1), O(n), O(logn), etc as classes or categories of growth. Some categories will take more time to do than others. These categories help give us a way of ordering the algorithm performance. Some grown faster as the input n grows. The following table demonstrates said growth numerically. In the table below think of log(n) as the ceiling of log_2. Algorithm 1 prints hello once and it doesn't depend on n, so it will always run in constant time, so it is O(1). Algorithm 2 prints hello 3 times, however it does not depend on an input size. Even as n grows, this algorithm will always only print hello 3 times. That being said 3, is a constant, so this algorithm is also O(1). Algorithm 3 - This acts like "log_2"
Algorithm 4 - This acts like "log_3"
Algorithm 5 - This acts like "log_1.02"
Algorithm 5 is important, as it helps show that as long as the number is greater than 1 and the result is repeatedly multiplied against itself, that you are looking at a logarithmic algorithm. This algorithm is simple, which prints hello n times. This algorithm shows a variation, where it will print hello n/2 times. n/2 = 1/2 * n. We ignore the 1/2 constant and see that this algorithm is O(n). O(n^2) is obtained easily by nesting standard for loops. Like algorithm 10, but with some variations. This is like algorithm 10, but with 3 loops instead of 2. Like algorithm 12, but with some variations that still yield O(n^3). The above give several straight forward examples, and variations to help demonstrate what subtle changes can be introduced that really don't change the analysis. Hopefully it gives you enough insight. 1 millisecond to complete if you have 2 elements. 2 milliseconds to complete if you have 4 elements. 3 milliseconds to complete if you have 8 elements. 4 milliseconds to complete if you have 16 elements. n milliseconds to complete if you have 2**n elements. Then it takes log2(n) time. The Big O notation, loosely speaking, means that the relationship only needs to be true for large n, and that constant factors and smaller terms can be ignored. Logarithmic running time (O(log n)) essentially means that the running time grows in proportion to the logarithm of the input size - as an example, if 10 items takes at most some amount of time x, and 100 items takes at most, say, 2x, and 10,000 items takes at most 4x, then it's looking like an O(log n) time complexity. Ok let's try and fully understand what a logarithm actually is. Imagine we have a rope and we have tied it to a horse. If the rope is directly tied to the horse, the force the horse would need to pull away (say, from a man) is directly 1. Now imagine the rope is looped round a pole. The horse to get away will now have to pull many times harder. The amount of times will depend on the roughness of the rope and the size of the pole, but let's assume it will multiply one's strength by 10 (when the rope makes a complete turn). Now if the rope is looped once, the horse will need to pull 10 times harder. If the human decides to make it really difficult for the horse, he may loop the rope again round a pole, increasing it's strength by an additional 10 times. A third loop will again increase the strength by a further 10 times. We can see that for each loop, the value increases by 10. The number of turns required to get any number is called the logarithm of the number i.e. we need 3 posts to multiple your strength by 1000 times, 6 posts to multiply your strength by 1,000,000. 3 is the logarithm of 1,000, and 6 is the logarithm of 1,000,000 (base 10). So what does O(log n) actually mean? Now the example above did use base 10, but fortunately the base of the log is insignificant when we talk about big o notation. Now let's imagine you are trying to guess a number between 1-100. Your Friend: Guess my number between 1-100! Your Friend: YOU GOT IT! Now it took you 7 guesses to get this right. But what is the relationship here? What is the most amount of items that you can guess from each additional guess? Using the graph, we can see that if we use a binary search to guess a number between 1-100 it will take us at most 7 attempts. If we had 128 numbers, we could also guess the number in 7 attemps but 129 numbers will takes us at most 8 attempts (in relations to logarithms, here we would need 7 guesses for a 128 value range, 10 guesses for a 1024 value range. 7 is he logarithm of 128, 10 is the logarithm of 1024 (base 2)). Notice that I have bolded 'at most'. Big o notation always refers to the worse case. If you're lucky, you could guess the number in one attempt and so the best case is O(1), but that's another story. What about O(n log n)? You will eventually come across a linerarithmic time O(n log(n) algorithm. The rule of thumb above applies again, but this time the logarithmic function has to run n times e.g. reducing the size of a list n times, which occurs in algorithms like a mergesort. You can easily identify if the algorithmic time is n log n. Look for an outer loop which iterates through a list (O(n)). Then look to see if there is an inner loop. If the inner loop is cutting/reducing the data set on each iteration, that loop is (O(log n), and so the overall algorithm is = O(n log n). Disclaimer: The rope-logarithm example was grabbed from the excellent Mathematician's Delight book by W.Sawyer. You can think of O(log N) intuitively by saying the time is proportional to the number of digits in N.
If an operation performs constant time work on each digit or bit of an input, the whole operation will take time proportional to the number of digits or bits in the input, not the magnitude of the input; thus, O(log N) rather than O(N). If an operation makes a series of constant time decisions each of which halves (reduces by a factor of 3, 4, 5..) the size of the input to be considered, the whole will take time proportional to log base 2 (base 3, base 4, base 5...) of the size N of the input, rather than being O(N). If you increase the problem size by a multiplicative amount (i.e. multiply its size by 10), the work is only increased by an additive amount. Applying this to your binary tree question so you have a good application: if you double the number of nodes in a binary tree, the height only increases by 1 (an additive amount). If you double it again, it still only increased by 1. (Obviously I'm assuming it stays balanced and such). That way, instead of doubling your work when the problem size is multiplied, you're only doing very slightly more work. That's why O(log n) algorithms are awesome. It is the number of times you can cut a log of length n repeatedly into b equal parts before reaching a section of size 1. Here is some functions and their expected complexities. Numbers are indicating statement execution frequencies. 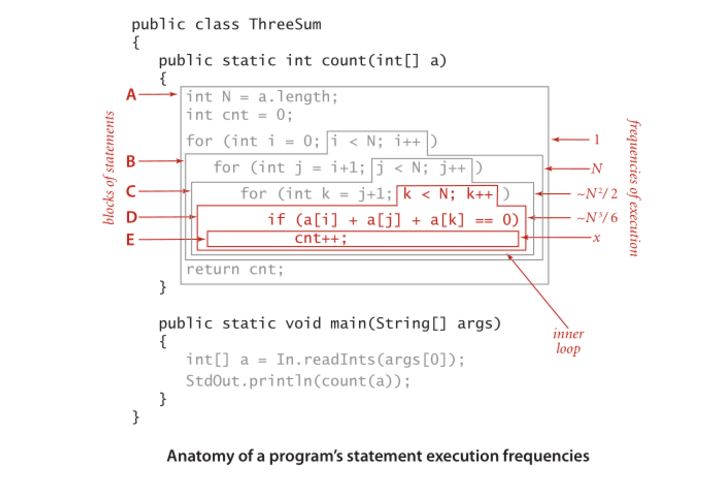 Anatomy of a program’s statement execution frequencies. Analyzing the running time of a program (example). Divide and conquer algorithms usually have a logn component to the running time. This comes from the repeated halving of the input. In the case of binary search, every iteration you throw away half of the input. It should be noted that in Big-O notation, log is log base 2. Edit: As noted, the log base doesn't matter, but when deriving the Big-O performance of an algorithm, the log factor will come from halving, hence why I think of it as base 2. But what exactly is O(log n)? For example, what does it mean to say that the height of a >complete binary tree is O(log n)? I would rephrase this as 'height of a complete binary tree is log n'. Figuring the height of a complete binary tree would be O(log n), if you were traversing down step by step. I cannot understand how to identify a function with a logarithmic time. Logarithm is essentially the inverse of exponentiation. So, if each 'step' of your function is eliminating a factor of elements from the original item set, that is a logarithmic time algorithm. For the tree example, you can easily see that stepping down a level of nodes cuts down an exponential number of elements as you continue traversing. The popular example of looking through a name-sorted phone book is essentially equivalent to traversing down a binary search tree (middle page is the root element, and you can deduce at each step whether to go left or right). It simply means that the time needed for this task grows with log(n) (example : 2s for n = 10, 4s for n = 100, ...). Read the Wikipedia articles on Binary Search Algorithm and Big O Notation for more precisions. O(log n) refers to a function (or algorithm, or step in an algorithm) working in an amount of time proportional to the logarithm (usually base 2 in most cases, but not always, and in any event this is insignificant by big-O notation*) of the size of the input. The logarithmic function is the inverse of the exponential function. Put another way, if your input grows exponentially (rather than linearly, as you would normally consider it), your function grows linearly. O(log n) running times are very common in any sort of divide-and-conquer application, because you are (ideally) cutting the work in half every time. If in each of the division or conquer steps, you are doing constant time work (or work that is not constant-time, but with time growing more slowly than O(log n)), then your entire function is O(log n). It's fairly common to have each step require linear time on the input instead; this will amount to a total time complexity of O(n log n). The running time complexity of binary search is an example of O(log n). This is because in binary search, you are always ignoring half of your input in each later step by dividing the array in half and only focusing on one half with each step. Each step is constant-time, because in binary search you only need to compare one element with your key in order to figure out what to do next irregardless of how big the array you are considering is at any point. So you do approximately log(n)/log(2) steps. The running time complexity of merge sort is an example of O(n log n). This is because you are dividing the array in half with each step, resulting in a total of approximately log(n)/log(2) steps. However, in each step you need to perform merge operations on all elements (whether it's one merge operation on two sublists of n/2 elements, or two merge operations on four sublists of n/4 elements, is irrelevant because it adds to having to do this for n elements in each step). 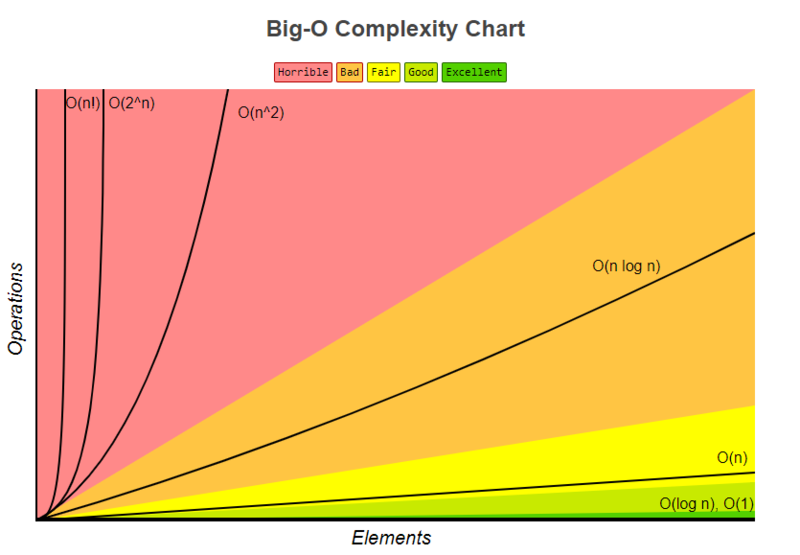 Thus, the total complexity is O(n log n). *Remember that big-O notation, by definition, constants don't matter. Also by the change of base rule for logarithms, the only difference between logarithms of different bases is a constant factor. O(log n) is a bit misleading, more precisely it's O(log2 n), i.e. (logarithm with base 2). 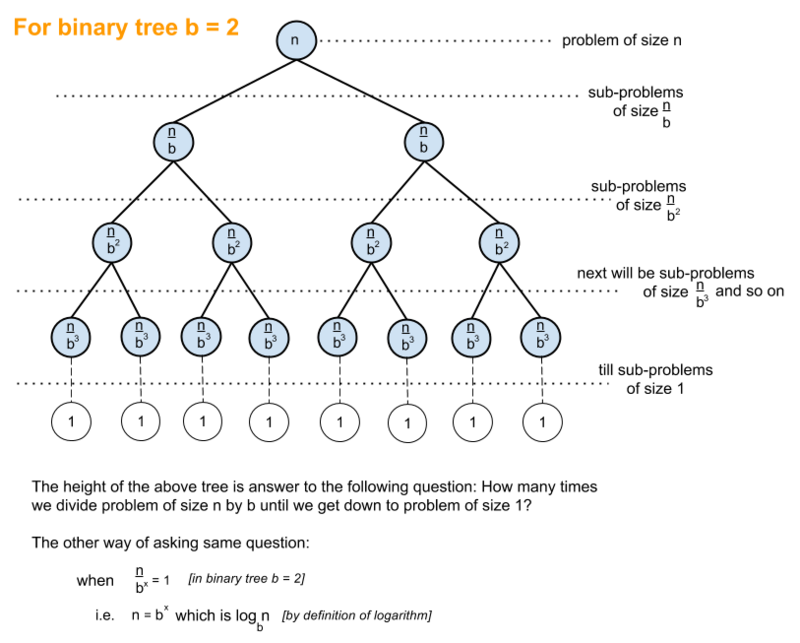 The height of a balanced binary tree is O(log2 n), since every node has two (note the "two" as in log2 n) child nodes. So, a tree with n nodes has a height of log2 n.
Another example is binary search, which has a running time of O(log2 n) because at every step you divide the search space by 2. If you plot a logarithmic function on a graphical calculator or something similar, you'll see that it rises really slowly -- even more slowly than a linear function. This is why algorithms with a logarithmic time complexity are highly sought after: even for really big n (let's say n = 10^8, for example), they perform more than acceptably. What it means precisely is "as n tends towards infinity, the time tends towards a*log(n) where a is a constant scaling factor". Or actually, it doesn't quite mean that; more likely it means something like "time divided by a*log(n) tends towards 1". "Tends towards" has the usual mathematical meaning from 'analysis': for example, that "if you pick any arbitrarily small non-zero constant k, then I can find a corresponding value X such that ((time/(a*log(n))) - 1) is less than k for all values of n greater than X." In lay terms, it means that the equation for time may have some other components: e.g. it may have some constant startup time; but these other components pale towards insignificance for large values of n, and the a*log(n) is the dominating term for large n.
... then this would be O(n squared) because, no matter what the values of the constants a, b, c, and non-zero d, the d*n*n term would always dominate over the others for any sufficiently large value of n.
That's what bit O notation means: it means "what is the order of dominant term for any sufficiently large n". I can add something interesting, that I read in book by Kormen and etc. a long time ago. Now, imagine a problem, where we have to find a solution in a problem space. This problem space should be finite. Now, if you can prove, that at every iteration of your algorithm you cut off a fraction of this space, that is no less than some limit, this means that your algorithm is running in O(logN) time. I should point out, that we are talking here about a relative fraction limit, not the absolute one. The binary search is a classical example. At each step we throw away 1/2 of the problem space. But binary search is not the only such example. Suppose, you proved somehow, that at each step you throw away at least 1/128 of problem space. That means, your program is still running at O(logN) time, although significantly slower than the binary search. This is a very good hint in analyzing of recursive algorithms. It often can be proved that at each step the recursion will not use several variants, and this leads to the cutoff of some fraction in problem space. I can give an example for a for loop and maybe once grasped the concept maybe it will be simpler to understand in different contexts. That means that in the loop the step grows exponentially. E.g. Although n is somewhere between 512 and 1023, only 10 iterations take place. This is because the step in the loop grows exponentially and thus takes only 10 iterations to reach the termination. The logarithm of x (to the base of a) is the reverse function of a^x. It is like saying that logarithm is the inverse of exponential. 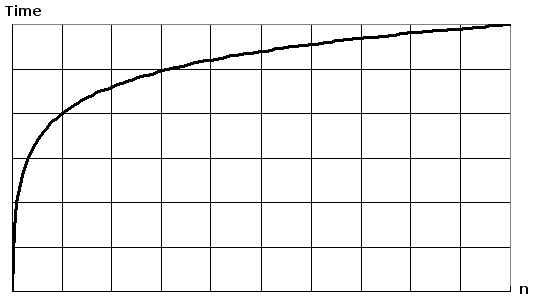 Now try to see it that way, if exponential grows very fast then logarithm grows (inversely) very slow. The difference between O(n) and O(log(n)) is huge, similar to the difference between O(n) and O(a^n) (a being a constant). for all N>N0  "C*g(n) > f(n) > 0" is true. Ant it seems that this notation was mostly have taken from mathematics. On the basis of the issues discussed here, I propose that members of SIGACT, and editors of computer science and mathematics journals, adopt notations as defined above, unless a better alternative can be found reasonably soon. Today is 2016, but we use it still today. But even in mathematical analysis sometimes this symbol was used in meaning "C*g(n) > f(n) > 0". Actually, if you have a list of n elements, and create a binary tree from that list (like in the divide and conquer algorithm), you will keep dividing by 2 until you reach lists of size 1 (the leaves). Every time we write an algorithm or code we try to analyze its asymptotic complexity. It is different from its time complexity. Asymptotic complexity is the behavior of execution time of an algorithm while the time complexity is the actual execution time. But some people use these terms interchangeably. Because time complexity depends on various parameters viz. The actual execution time is not a good measure for analysis. Instead we take input size as the parameter because whatever the code is, the input is same. So the execution time is a function of input size. Given n input elements, to search an element in the array you need at most 'n' comparisons. In other words, no matter what programming language you use, what coding style you prefer, on what system you execute it. In the worst case scenario it requires only n comparisons.The execution time is linearly proportional to the input size. And its not just search, whatever may be the work (increment, compare or any operation) its a function of input size. So when you say any algorithm is O(log n) it means the execution time is log times the input size n.
See as the input size increased the work done is increased and it is independent of any machine. And if you try to find out the value of units of work It's actually dependent onto those above specified parameters.It will change according to the systems and all. Searching for 4 yields 3 hits: 6, 3 then 4. And log2 12 = 3, which is a good apporximate to how many hits where needed. If you are looking for a intuition based answer I would like to put up two interpretations for you. Imagine a very high hill with a very broad base as well. To reach the top of the hill there are two ways: one is a dedicated pathway going spirally around the hill reaching at the top, the other: small terrace like carvings cut out to provide a staircase. Now if the first way is reaching in linear time O(n), the second one is O(log n). Imagine an algorithm, which accepts an integer, n as input and completes in time proportional to n then it is O(n) or theta(n) but if it runs in time proportion to the number of digits or the number of bits in the binary representation on number then the algorithm runs in O(log n) or theta(log n) time. I would like to add that the height of the tree is the length of the longest path from the root to a leaf, and that the height of a node is the length of the longest path from that node to a leaf. The path means the number of nodes we encounter while traversing the tree between two nodes. In order to achieve O(log n) time complexity, the tree should be balanced, meaning that the difference of the height between the children of any node should be less than or equal to 1. Therefore, trees do not always guarantee a time complexity O(log n), unless they are balanced. Actually in some cases, the time complexity of searching in a tree can be O(n) in the worst case scenario. You can take a look at the balance trees such as AVL tree. This one works on balancing the tree while inserting data in order to keep a time complexity of (log n) while searching in the tree. Not the answer you're looking for? Browse other questions tagged time-complexity big-o or ask your own question. What is the difference or separates O(log(n)) and O(n)? Why is the time complexity O(log n)? Algorithm complexity - explanation of O(log n)? Is there a way to tell whether a subroutine has runtime log(n)? What is the difference between Θ(n) and O(n)? Big-O for Eight Year Olds? What exactly does O(n) space complexity mean and how inefficient is it? What does n mean in big-oh complexity? Can all solvable algorithm problems being measured by the seven common order of magnitude functions?